There are seven legislative assembly constituency in Pratapgarh district for the 2017 Assembly elections. They are 245 Babaganj, 247 Bishwavnathganj, 246 Kunda, 249 Patti, 248 Pratapgarh, 244 Rampur Khas, 250 Raniganj. When Uttar Pradesh assembly election 2017 is getting ready to electios new Assembly, Pratapgarh is not anywhere behind in the election heat. 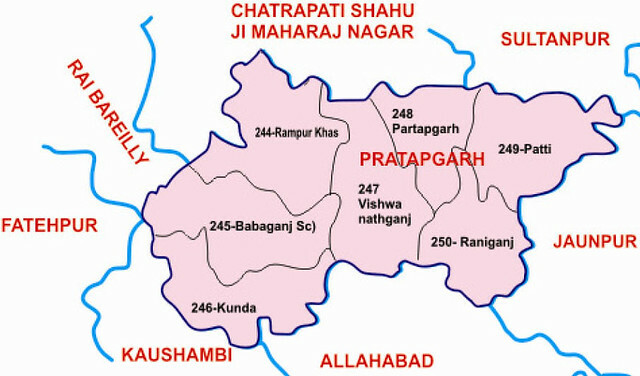 The Pratapgarh district (Hindi: प्रतापगढ़ ज़िला, Urdu: پرتاپ گڑھ ضلع‎) is one of the districts of Uttar Pradesh state of India, and Pratapgarh town is the district headquarters. The Pratapgarh district is a part of Allahabad division and lies between 25° 34' and 26° 11' latitudes while between 81° 19' and 82° 27' longitudes.